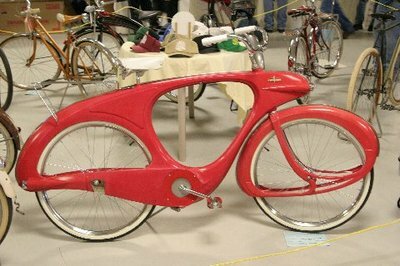 Posted on Thu, Apr 26, 2012 : 10:11 a.m.
An event billed as the oldest and largest antique and classic bicycle show in the country returns to the Washtenaw Farm Council Grounds on Sunday. The 32nd Annual Ann Arbor / Saline Classic Bicycle Show and Swap Meet will host more than 220 dealers. Last year's show included more than 7,000 classic, vintage and collectible bikes. • Show bikes: Typically, 50 to 75 bicycles are entered into 10 categories and the public votes for its favorites. Awards are presented in such categories as Best Unrestored, Best Lady’s, Best Motorized Bike, and more. • Classic Bike of the Year Award: Judged event for best restored and best preserved bikes. • A mini-bike show and swap meet. • An auction at 11:30 a.m.: Anyone who thinks they may have a valuable or collectible bike can put it on the block for only $10 and let the crowd decide its value. If no one exceeds the owner’s asking price the bike goes back to the owner and they’ll get $5 back. The result is an appraisal from the crowd for $5. The show takes place 8 a.m.-3:30 p.m. at the Farm Council Grounds, 5055 Ann Arbor / Saline Road. Admission: $3 admission (kids under 10 free). Parking is free. For more information, see the show's website. Thu, Apr 26, 2012 : 3:25 p.m.
Anti-bike couch potatoes should not take this sitting down. They should organize a competing event, where they bring out their classic and retro couches for display. They could even have contests and games, like &quot;find the change in the couch&quot;, and &quot;match the cushion indentations to the couch owner&quot;. Thu, Apr 26, 2012 : 2:56 p.m.
Thu, Apr 26, 2012 : 2:17 p.m.
Hipsters will have to take off work, oh wait.